Summer is the ideal time to whip up beautiful and refreshing treats. 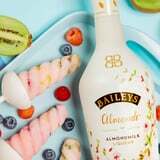 That's why we've partnered with Baileys® Almande to dish up this dairy-free spin on our popular Unicorn Pops. When Summer reaches peak sultriness, it's easy to reach for something icy and sweet for a quick cool-down. Instead of selecting a heavy sundae or a rich smoothie, why not try a delicious, dairy-free treat? With tasty ingredients, including hibiscus tea, grapefruit juice, and a kick of almond liquor, these unicorn pops are sheer magic for your taste buds. Grab your popsicle molds! Brew the hibiscus tea and set aside to cool. Prepare the fruit and fill each popsicle mold with the fresh fruit. Start by inserting your popsicle stick into the quartered kiwi and securing it into the mold; then add the rest of the fruit. Mix together the grapefruit juice, brewed hibiscus tea, Baileys® Almande, and desired amount of agave in a measuring cup. Pour the mix into your molds and freeze overnight. Once frozen, remove from mold and enjoy!